After a quick but tasty cookie lunch, we’re back in sessions. This time we’re hanging out with Lisa’s favorite Matt. 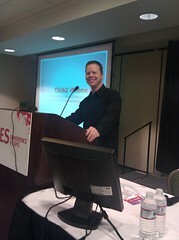 Matthew Bailey, SES Advisory Board & President, Site Logic Marketing (@sitelogic). Matt’s going to be laying down the law on how analytics should be handled when you take on a new client. Excited? You should be. It’s really cold in this session. Matt agrees and suggests we huddle together for warmth. I think the penguins in the corner agree. What should you do when you get a site for the first time? He’s aggregated the opinions of several analysts and what they like to do first. Reports are Caveman Analytics. Page Views, Hits, Top 10 Pages, Monthly Visitors, Time on Site…those are all so 1990. Those things are off the shelf products. In order to get good relevant data, you need to make it fit your business. Find the Errors First – Find the 404 errors. Don’t rely on the SE products because that doesn’t tell you what your users found, only what Google found. Run a report looking for your error page and see where it shows up. You want the errors that people saw. That affects the spidering of your site but more importantly, the customer experience. Look up the navigation analysis and see what the bounce rate is. If you have a 404 page, find out what’s sending traffic there. Check out your site exit rate. How granular do you want to get? As granular as you want to make it. If you don’t want people to see your 404 pages, run this report regularly, every couple months or once a month. Detect Duplicate Content – Filter Top Pages by URL strings to find duplicates. See if you can find duplicated created by your CMS (his example is Magenta). It might be ad URLs that have been indexed. Segment Your Data – Not enough people do this. Product areas, business areas, personas, keywords – figure out how you’re doing in all of these areas. Your page views might be 34,000. Is that good or bad? It depends. This is just measuring shots on goal, not the actual score. It’s just data and data is value neutral. You have to associate the data to other data. to get content. Information is data plus context. Page Views per visitor = 8 Is that good or bad? Who knows. Question-asking is the single greatest tool humans have. – Neil Postman. You should constantly be asking why? Why are we doing this? Why aren’t we doing this? Why do red shirts die so often? Beaming down with Captain Kirk while wearing a red shirt will result in death 57.5% of the time. Now we’re discovering a cause. 42.5% die on board during a fight on the Enterprise. What makes a red shirt survive? If Kirk meets an alien woman when he beams down, the death rate is only 16%. Which is obviously why Kirk was a player, just to save his crew. Good man. Identify Rankings by Performance – If someone is looking for video cameras, they will enter a different page and look for different things than someone looking for an MP3 player. This is why you can’t boil it down to page views and overall conversion rates. If I’m looking at your site for the first time, I’m not measuring your site by rankings, I’m measuring your site by performances. If you don’t have goals, you can’t measure performance. You must clearly define your goals and put them in your analytics. Until you know your goals, you can’t judge what’s making you money. If you’re not measuring what’s making you money, you’re not measuring anything. Identify keywords by landing page, ranking, conversion, source. If you know that a keyword brings you traffic, conversion and value, that’s something you can capitalize on. If a keywords brings you a lot of traffic but little value, that’s not actually a good page. Performance provides direction – You can be selling a lot of low revenue products or you can be selling a lot of high revenue products. Justify your own expense by optimizing toward the margins, not just the volume. 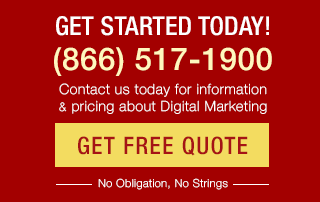 Your SEO campaign should produce profitability. Which content keeps people on the site? Which kicks them off the site? Measure not just by exit rate but by revenue. Which pages are generating money. Segment Entry Points – Having a high ranking doesn’t guarantee profitability. Category page ranked at 12. Lower bounce rate, higher conversion rate. They de-optimized the homepage for that keyword and optimized the category page because it converted better. Site level conversion rates are averages. You want to know what’s going on by landing page and by keyword. Some pages are converting well, some aren’t. You need to know which is which. 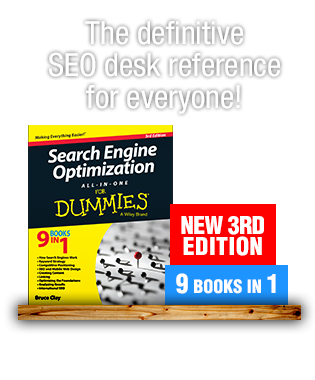 If you have two pages for the same keyword and one converts better than the other, you need to know. You can only do that when you set up your goals. Identify Bounce Rates – use segmentation to find out why people bounce. Use Weighted Sort to find out what the pages with a good mix of pages with visits to bounce rate. This will give you which landing pages have a high bounce rate and actual traffic. Follow The Money – The more you follow the money, the more effective you are as an analyst. Make things easy to understand for the C-set. Tell them what will make them money. You must have a Goal Value. If you don’t, you won’t get anywhere. Attach that dollar sign in the report. Take Action – Forrester study: Companies that brought in a full time analyst realized a 1200% ROI within six months. Why? Because they follow the money. Keyword Segment “Buckets” – Keywords are a big bucket of information. 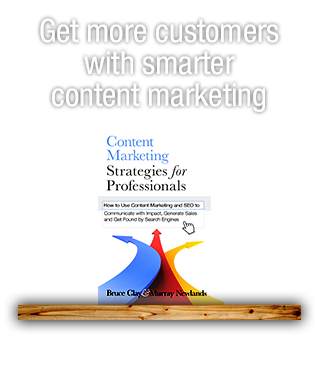 Start breaking down your keywords into buckets. Then segment those buckets into buckets. Remember to account for misspellings. Set up custom segments in Google. Once you find it, it asks dimension or metric. A keyword group is a dimension. The metric is KPIs around that group. Start with the dimension. Drag your keyword over. Change the “Condition” to “contains”. Value = “your keyword”. Don’t forget to name this segment or it won’t work. Break it down further by segmenting the segment. Watches, then Rolex. Or do it by landing pages. Watches > Page. The value you bring as an analyst is in the details. You don’t need to change the experience for everyone with every change. Improving the experience for small groups is your job. His new book is Internet Marketing: An Hour A Day. Buy it. More analytics training: mo.am/matt – Free SEO Analytics Video Lesson and a month of training for $1. Q: What should I look for in hiring an analytics person? Someone who asks questions. So many questions that you’re annoyed. But you need someone who not only gets the numbers, they should understand the marketing too. They need to see the numbers and the usability of the site as well. Matt doesn’t use time on site as a goal, he prefers interactions as goals. How do you assign value to branding activities? Make someone pick it (or start at a dollar) and then adjust as you go on. If your sales guys can’t define the value of a lead, you’re really stuck.